Oh, hail the 4x6 print! This month I'm going to use mostly 4x6 photos in my layouts. I've gotten in the habit of cropping down my photos before printing to a size I think will work well on my layouts. 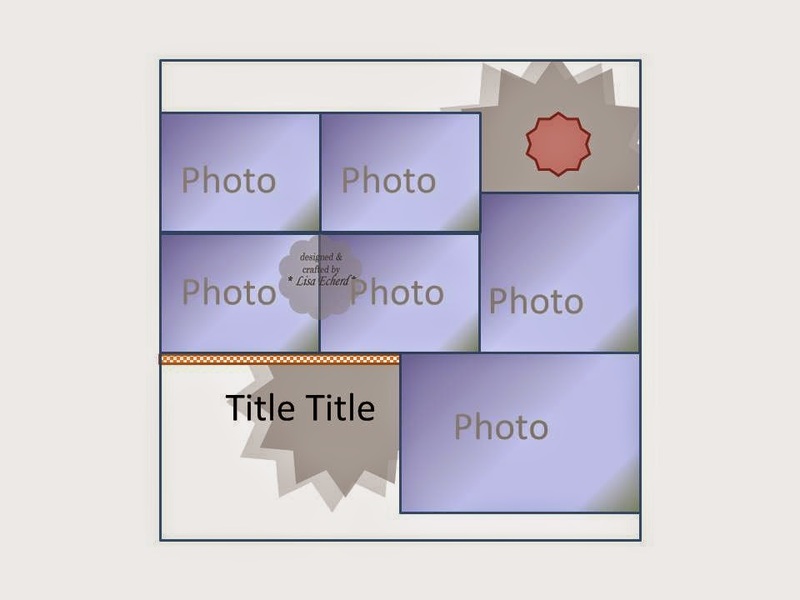 Often this means a 3x5 or sometimes a square photo. I don't always have the complete layout in mind. I just know which photos I think need the full 4x6 treatment and which can go a bit smaller. This all works great until I want to print a bunch of photos. Then it is just overwhelming to figure out sizes for everything. 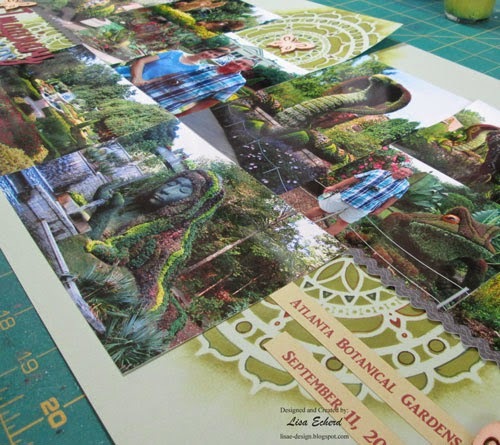 I did know that I had far more photos for these pages of the Atlanta Botanical Gardens than I could use as full 4x6. So some of them are cropped to 3" x 4" with two photos per print. I also cropped a bunch to 4x4 which will be on another page later in the week. I was printing these on a Walgreens special of 50 photos for $6 so I did quite a few more 4x6 and those will be coming up in later pages. So this month we celebrate the 4x6 print with lots of layouts. The first one has 12 photos. 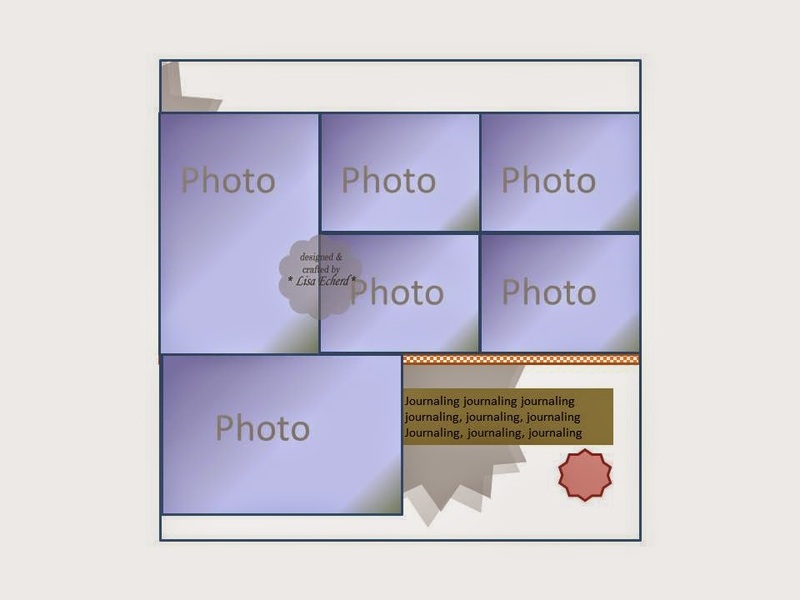 If you use truly 4" x 6" prints, you would get 7 of those plus one cropped down to 4x4. However the sketch below is adapted, it holds a lot of photos. The page also features some stenciling that picks up on the theme of the creatures created from a frame filled with plant materials. Stenciling often fits in so well, I don't need a lot of other embellishment. To learn more about the most versatile tool in the scrapbooking world, check out Scrapbooking with Stencils class. It is amazing what you can do with a few stencils and many products you already have! 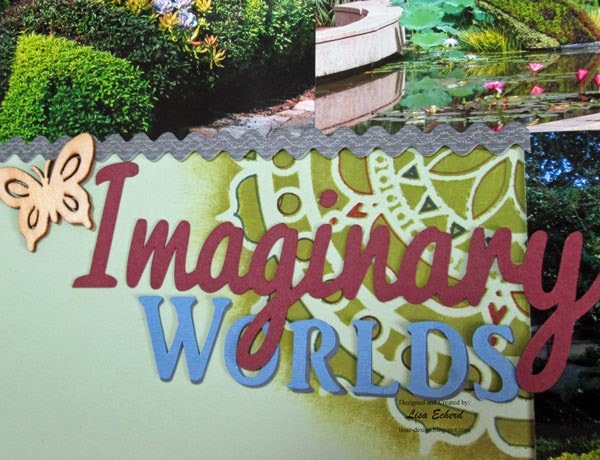 The garden exhibit was called Imaginary Worlds. 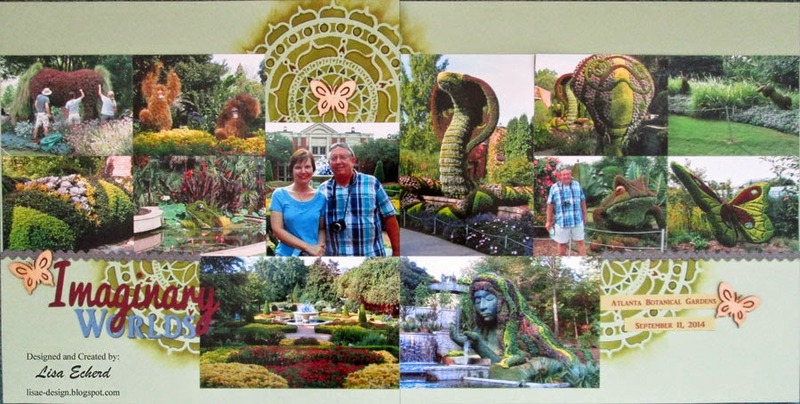 My husband liked the snakes best and I admit they were spectacular. My favorite was Mother Nature which was the largest sculpture with a waterfall spilling over her hand. I also chuckled at the chimpanzees. More about the rest of the garden will be coming along later in the week in another spread that has a pocket for memorabilia and lots of journaling. Don't forget my giveaway through Thursday. Click here for yesterday's post to put your name in the hat for a drawing for a free pass to TrueScrap coming up soon. It is a $99 value so you don't want to miss your chance! Lisa, this layout is lovely. Fabulous two-pager, Lisa! I struggle with them. The doily and stencil combos around the page are beautiful!